They might look like a large gentle rabbit, but brown hares are powerful athletes that can reach speeds of 45mph. They're also famous for their boxing skills! Hares are herbivorous and feed mainly on grasses and herbs. Hares might look like rabbits but they are much larger and have longer ears and legs. They are also much stronger. Their powerful hind legs allow them to reach speeds of 45mph (72km/h)! They do not use burrows like their close relatives the rabbit. They live above ground and will make small depressions in the ground which they use for cover. Brown Hares can be seen standing on their hind legs ‘boxing’ during the breeding season. This was long assumed to be males fighting each other for females, but it is in fact females fighting away the males! 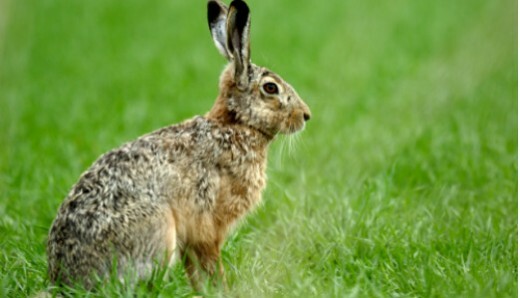 Brown Hare are vulnerable to hunting and habitat loss as well as fragmentation from farming. There is a long history of persecution of hares in Europe. Hare ‘coursing’ is the chasing and killing hares with dogs for fun. It was once a popular pastime in the UK but has now been banned. However, hare coursing continues in other countries, such as the Republic of Ireland and Spain, as well as the USA and Russia.